Seamless roofing system is a unique roofing system which is designed from the concept to completion for strength, durability and weather resistant and offers cost effective building solution and maintenance free. They are preferable on other roofs because of permanent waterproofing, long life, self supporting and walk able. This roofing system can be joined using locking system .It eliminates the damaging effects of thermal movement. It also provides design flexibility and fire resistant. When it is properly installed and maintained it will stop leaks after bridging specified leaks and cracks. It can withstand all climatic conditions ranging from salt-water regions to upper mountains snow, rain forests and deserts. 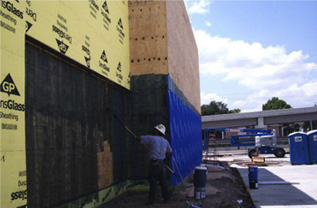 It is available in many types include aged spray applied foam and coating systems and concrete.